India has politely turned down Pakistan’s proposal for bilateral cooperation on nuclear safety and peaceful uses of nuclear energy, saying the idea was not viable until there was adequate trust and confidence between the two countries. The BJP and the Congress continued to spar over the Lokpal Bill as the Rajya Sabha witnessed sharp exchanges between Leader of the Opposition Arun Jaitley and Congress MP Abhishek Manu Singhvi today. The fate of the long-discussed Lokpal Bill, passed in the Lok Sabha two days ago, appeared uncertain Thursday evening with the government trying desperately to win the numbers game in the Rajya Sabha where it is in a minority and the Opposition and even some of its allies giving notices for as many as 173 amendments. The BJP turned the tables on the government by focusing exclusively on the Lokayukta issue in the Lokpal and Lokyaukta, 2011 Bill in the Rajya Sabha today. The BJP seems to have learnt some smart lesson from the debate in the Lok Sabha where it had highlighted issues like the quota in the Lokpal institution and the religion-based reservation in the proposed setting up of Lokpal institution. 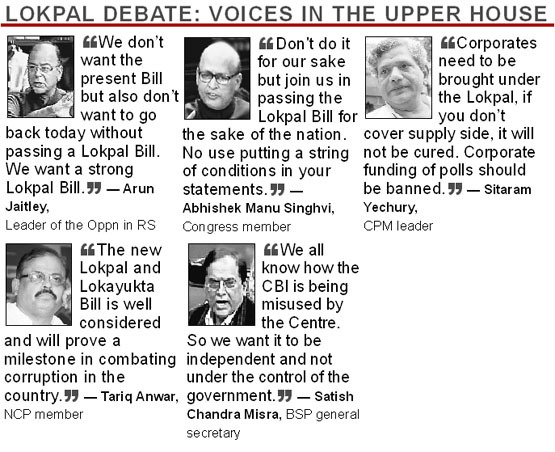 Even on the CBI issue, there was no one view among the critics of the Bill in the Lok Sabha. A day after Anna Hazare called off his agitations on Lokpal, Team Anna today admitted that his fast did not create the desired pressure on government and said there was no point in passing this "completely useless" Bill. The Core Committee of Team Anna will be meeting in Ralegan Siddhi on January two and three to decide on the future course of action as Hazare abruptly announced the scrapping of the jail bharo agitation and other protest plans. The formation of Lokayuktas in states under the Lokpal bill emerged as a major sticking point in the Rajya Sabha Thursday, with not just the opposition but even the government's allies rejecting the provision as an attack on the federal structure. Senior members of the BJP and the Congress today entered into war of words over a reference to former Prime Minister Rajiv Gandhi during the ongoing debate on the Lokpal Bill in the Rajya Sabha. 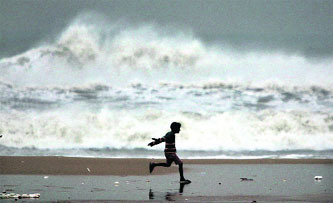 Coastal districts of Tamil Nadu and Andhra Pradesh were today put on high alert ahead of cyclonic storm "Thane" that is expected to hit the Bay of Bengal coast in the two states by tomorrow morning. While Uttar Pradesh Chief Minister Mayawati has set a dubious record of sacking 15 ministers in order to refurbish her image, more heads may roll ahead of the Assembly poll with as many as 13 ministers landing in the Lokayukta net. In the past four days alone, the Chief Minister has sacked six of her ministers, many of whom were facing graft charges, leaving 35 members in the Mayawati Ministry. Pakistan has formally conveyed to India that its nine-member judicial commission will visit here next month to interview key persons linked to the probe into the 2008 Mumbai terror attacks. New Delhi was informed on Tuesday that the Pakistan judicial commission will visit India in January 2012 and the mutually convenient dates of the tour will be finalised soon, official sources said. At the expert-level talks between the two countries in Islamabad earlier this week on nuclear and conventional Confidence-Building Measures (CBMs), India pointed out that it was cooperating in the area of nuclear safety at the multilateral level at the IAEA. New Delhi could cooperate with Pakistan also at the multilateral level with the IAEA framework. However, Islamabad must enunciate its nuclear doctrine, including the command and control structure of its nuclear assets, sources said today. The Pakistani delegation was told that it was a matter of concern for not only India but the entire international community that Pakistan was yet to publicly state its nuclear policy. The Indian side was led at the talks on nuclear CBMs by Venkatesh Varma, Joint Secretary (Disarmament), in the External Affairs Ministry, and on conventional CBMs by YK Sinha, Joint Secretary (Pakistan) in the ministry. The Pakistani delegation at the talks on both the subjects was headed by Munawar Saeed Bhatti, Additional Secretary in the Pakistani Foreign Ministry. The sources said the talks, held after a gap of four years, were held in an extremely cordial and constructive atmosphere with both sides frankly exchanging views. The two sides agreed to recommend to their Foreign Secretaries to extend the validity of the agreement on reducing the risk from accidents relating to nuclear weapons for another five years. Pakistan has for long been saying that it has a credible nuclear doctrine and that its nuclear assets were absolutely safe. However, the international community has expressed apprehensions that the Pakistani nuclear arsenal could fall into the hands of terrorist groups, given the volatile political situation in the country. Pakistan was also urged by the Indian side to contribute to the international non-proliferation agenda by participating in the FMCT negotiations and the conference on disarmament in Geneva. Pakistan has been blocking the FMCT negotiations by refusing to take part in these talks. There was also a proposal from the Pakistan side that India should relocate its heavy artillery along the Line of Control (LoC) and the International Border (IB). However, this proposal also did not find favour with New Delhi. The Pakistani side was told that the proposal could be considered only if peace and tranquility was maintained along the border and ceasefire violations and infiltration stopped. Having forced a brief adjournment seeking the presence of Prime Minister Manmohan Singh in the House after the Bill was tabled in the morning, the BJP, led by the Leader of the Opposition, accused the government of bringing a Bill that was “subservient” and could create “constitutional havoc” where the Centre would be encouraged to “usurp” rights of states through the provision of setting up of Lokayuktas. Initiating the debate, Jaitley urged the House to heed the “sense of the nation”. “There is a sense of this nation, that both the Houses of Parliament enact a strong Lokpal law,” he said. “We are being tested. Can we rise to the occasion?” he asked and referred to the perception among the people that those in the government and those in politics did not want a strong law against corruption. “We don’t want the present Bill but also don’t want to go back today without passing a Lokpal Bill. We want a strong Lokpal Bill,” he said. He alleged the government wanted to create a smokescreen by talking to civil society. “If you are creating history, let us not create bad history. We will be leaving a lot of task for the next generation to do,” he said. He made it clear the BJP would not support the Bill in the present form. “Please accept amendments that the colleagues have moved,” he said. Congress member Abhishek Manu Singhvi, who heads the Parliamentary panel that drafted the legislation before it was reworked by the government and introduced in Parliament, was the first to counter the claims of the BJP. Exhorting the BJP to pass the Lokpal Bill for the “nation’s sake”, he accused the main Opposition party of coming up with excuses not to clear the legislation, he declared that it was “in search of the elusive perfect to deny the good”. “They (the BJP) are making statements of stringent conditions in the Bill and are saying they want to pass a strong and comprehensive Bill but after three months. They are using it (conditions) as a pretext not to pass the Bill,” Singhvi said. “If you don’t want to pass the Bill, have the courage to say so and don’t hide in excuses,” he said. He based the BJP’s Opposition to the Bill on the influence the government would have in selecting and removing a Lokpal; the failure to make the CBI an independent agency; the portion on the Lokayukta or anti-corruption watchdog to be established in states and the Bill not adhering to the sense of the House on bringing the Citizen’s Charter and Group C and D employees under the Lokpal. The Leader of the Opposition did not let go the opportunity to take on the Prime Minister even. “There is no contradiction between the fight against corruption and retaining the federal structure,” he said. However, Singhvi put up with a spirited defence of the Bill and said the BJP wanted to create a “behemoth of unimaginable proportions” by bringing the CBI, the CVC and the Citizen’s Charter within the Lokpal’s ambit. He was also critical of the demand that the Lokpal have suo moto powers and control over preliminary inquiry, actual investigation as well as prosecution. “Thank God, you did not say judgment must also come from Lokpal,” he said. Referring to the composition of the nine-member Lokpal, Singhvi said the Bill did not ask for reservation, but merely sought “representation” to OBCs, SCs, STs, women and minorities. Getting back at Jaitley for the dig he took at the Prime Minister, the Congress member said, “Your constitutional cocktail doesn’t have the punch it should have.” He also accused the BJP of not voting to grant constitutional status to the Lokpal only because the suggestion had come from Rahul Gandhi. The battlelines were clearly drawn with the government pushing hard for its Bill, providing for the anti-graft institution of an ombudsman at the centre and states, and the opposition trashing it as "constitutionally vulnerable". Official sources said notices have been given for 173 amendments to the bill, introduced by the government in the upper house in the morning. Apart from opposition parties, notices for amendments that would change the very nature of the legislation have been given by its ally the Trinamool Congress as well as the Samajwadi Party (SP), the Rashtriya Janata Dal (RJD), the Left and the BJP. While the Trinamool Congress is part of the Congress-led United Progressive Alliance (UPA), the SP and the RJD support the government from outside. In the 243-member Upper House of Parliament, the Congress and its allies have only 92 members, well short of the 122 magic number. It hopes for support from smaller parties such as the BSP and the SP. As the debate continued inside the House, efforts were also on outside to resolve the logjam over the long-discussed legislation. The Congress core committee met in the evening to finalise strategy in the wake of the extraordinary number of amendments to the document that has been at the centre stage of a furious national debate. "We admit we don't have the numbers in the Rajya Sabha. But we are trying our best to get the bill passed. Our intentions are honest," Minister of State for Parliamentary Affairs Rajeev Shukla said as speculation mounted that the bill would now be pushed to the budget session next February. A key rallying point is the Mamata Banerjee-led Trinamool Congress, which has six MPs in the Rajya Sabha and has sought deletion of a provision on setting up of state Lokayuktas. This has been the issue that has found resonance with most regional parties as well as the BJP. Informed sources said Trinamool Congress members have moved amendments to the bill on provisions that it considers impinge on the federal structure of the constitution and the power of the states to enact their own legislation. "If the Trinamool Congress presses its amendments, the government will face problems," a BJP leader told IANS. During the debate, speakers like Satish Misra (BSP) and Sitaram Yechury (CPI-M) cautioned the government against usurping the power of states and diluting the “spirit of the constitution” by imposing its idea on individual states. Even as the government tried all day yesterday to persuade the Trinamool Congress and other non-UPA supporters like the SP, RJD and the BSP on their side, Leader of Opposition Arun Jaitely moved fast and held sessions with all the doubting Thomases, including those from the Left and most of all the Trinamool Congress. Though Trinamool MPs, wary of being seen with the BJP, tried to underplay the contact with Jaitley saying, "Just if we sit and chat with someone (Jaitely) does it mean we are working at his behest?" Similar confabulations took place with BSP leaders as well. In the Lok Sabha a divided Opposition had conceded when Leader of the House Pranab Mukherjee gave verbal assurance to Leader of Opposition Sushma Swaraj's to accommodate her suggestion of reducing the number Lokpal members approving investigations against the Prime Minister from 3/4th of the Lokpal members to 2/3rd. Analysts pointed out that these two issues isolated the BJP because there were several parties, including the Trinamool Congress, the SP, the BSP, the RJD and the JD-U which were reluctant to be seen standing with the BJP when it was opposing the quota and religion based reservation. This despite the fact that most parties, including even the DMK, did object to the inclusion of Lokayukta. But in the Lok Sabha, the verbal assurance from Pranab Mukherjee that he would get incorporated the consent of the states for Lokyaukta, sufficed to satisfy the Trinamool Congress that their concern on the federal structure has been addressed by the government. But sources said Trinamool leader and West Bengal Chief Minister Mamata Banerjee, who was watching the debate in Kolkata was mighty impressed with the content of BJD leader Bhartuhari Mahtab who analysed threadbare the consequences of adding Lokayukta to the Lokpal Bill saying, "The Bill has four major lacunae. First it strikes at the autonomous of states guaranteed by the Constitution. "It is not for Union Government to impose the structure and function of the Lokayukta of state governments but it is for the state governments to decide what they want, bearing in mind their specific requirements." Sources said Mamata called up her party MP Kalyan Banerjee who had spoken on behalf of his party and leader of the party in the Lok Sabha Sudip Bandopadhyaya. But since they were all in the House, she could not get to them and then with some difficulty got across to them and fired Banerjee, who was tremendously crestfallen. After that Mamata decided to put her foot down and stick to the demand to strike off Laokyukta word from the Bill all through. Now the government knows not how to contend with the Trinamool objection. A day after Anna Hazare called off his agitations on Lokpal, Team Anna today admitted that his fast did not create the desired pressure on government and said there was no point in passing this "completely useless" Bill. 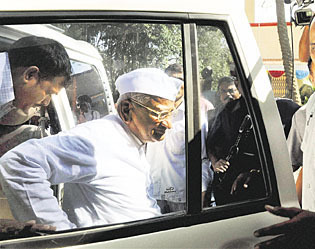 The Core Committee of Team Anna will be meeting in Ralegan Siddhi on January two and three to decide on the future course of action as Hazare abruptly announced the scrapping of the jail bharo agitation and other protest plans. "The fast was meant to create pressure. Now that on the first day itself they passed an ineffective and useless Bill, there was no value of that pressure. "So it was decided that it would not do any benefit and Anna's health was not well, so it was called off," Team Anna member Prashant Bhushan told reporters here after a meeting of some of the Core Committee members. The United Progressive Alliance (UPA) government's ally Trinamool Congress demanded deletion of the entire chapter on Lokayuktas, while main opposition Bharatiya Janata Party (BJP), Left and other parties came up with suggestions for not making it mandatory. Another ally, DMK, while making clear it will not move any amendment, said the provision was an attack on the country's federal structure. "Some people here asked why we are not bringing any amendments," party leader Tiruchi Siva said, referring to Leader of Opposition Arun Jaitley. "We want to register our views and we are strong in our views." Joining the league were parties like the Janata Dal-United (JD-U), Bahujan Samaj Party (BSP) and the Samajwadi Party (SP). "You can't say that we have safeguarded the provision, and so now parliament can make a law on state subject," BSP leader Satish Chandra Mishra said. It all started when noted criminal lawyer and BJP Rajya Sabha MP Ram Jethmalani referred to an article published in a European magazine in 1991 that contained "names, photographs and bank account numbers". His remarks were strongly objected to by the Congress members led by Mani Shankar Aiyar, a known Rajiv Gandhi loyalist. Immediately, the Congress members were on their feet protesting against Jethmalani. Aiyar and others objected saying Jethmalani was raising an issue that was not linked with the issue under discussion. The BJP and AIADMK members stood up to counter the Congress members and defend the lawyer. The BJP MP’s remarks were in context to persons having money stashed away in Swiss banks. Deputy Chairman K Rahman Khan, who repeatedly asked the protesting members to take their seats, said it was "not correct to bring the name of Prime Minister". After the ruling, Jethmalani spoke about the protocol that India signed with the Swiss government on August 30 on double taxation avoidance treaty and used a word to describe the government's intention. The Chair expunged the remark, saying it was unparliamentary. The BJP leader's remark again drew sharp reactions from the ruling benches and Khan had a tough time restoring order. As authorities braced for the storm that threatened to bring very heavy rainfall combined with squally winds gusting up to 135 kmph. The Tamil Nadu Government announced a holiday in educational institutions in the state's coastal districts, including Chennai, Cuddalore and Tiruvarur tomorrow. The regional meteorological office in Chennai said the cyclonic storm over southwest Bay of Bengal moved westward slightly and lay centred about 180 km east of Puducherry, 180 km southeast of Chennai. The system is likely to move westwards and cross north Tamil Nadu coast between Nagapattinam and Chennai, close to Puducherry around early tomorrow morning, it said. North Tamil Nadu and Puducherry could experience extremely heavy rainfall of 25 cm, while isolated heavy to very heavy rainfall would occur over south coastal Andhra Pradesh and Rayalseema, it said. Squally winds with speeds touching 55-65 kmph gusting to 75 kmph are likely along and off north Tamil Nadu, Puducherry and South Andhra Pradesh coasts. The wind speed would increase gradually, gusting to 135 kmph along and off north Tamil Nadu and adjoining south Andhra Pradesh coast from tonight, it said. The met office warned that the storm surge of about 1-1.5 m height above astronomical tide would inundate low-lying areas of Puducherry and Chennai, Tiruvallur, Kanchipuram and Villupuram districts of Tamil Nadu. Sea condition is very rough and would gradually become very high to phenomenal. Fishermen along north Tamil Nadu, Puducherry and south Andhra Pradesh coasts have been advised not to venture into the sea over the next 48 hours, the Met office said. The AP Government directed collectors of vulnerable coastal districts to immediately evacuate people living in low-lying areas and closer to the shore. While Uttar Pradesh Chief Minister Mayawati has set a dubious record of sacking 15 ministers in order to refurbish her image, more heads may roll ahead of the Assembly poll with as many as 13 ministers landing in the Lokayukta net. In the past four days alone, the Chief Minister has sacked six of her ministers, many of whom were facing graft charges, leaving 35 members in the Mayawati Ministry. While Lokayukta Justice NK Mehrotra has already recommended removal of small-scale industry minister Chandra Dev Ram Yadav finding him guilty of indulging in corrupt practices, 13 ministers, including her close aide Naseemuddin Siddiqui, are facing inquiry from the anti-graft ombudsman. Besides, many of the 28 MLAs facing the Lokayukta inquiry are from the ruling BSP. Yesterday, Mayawati sacked two ministers, including minister of state for alternative energy Akbar Hussain and minister of state for science and technology Yashpal Singh, on charges of corruption and anti-party activities. Earlier of Sunday, she had removed four ministers, including higher education minister Rakeshdhar Tripathi, agriculture education and research minister Rajpal Tyagi, minister of state for backward welfare(independent charge) Awdhesh Verma and minister of state for home guard Hari Om. Though, the government did not give any reason for sacking them, sources said the step has been taken against these ministers as they were mired in controversy involving corruption charges. Of the three, Rakeskdhar Tripathi is facing the Lokayukta probe into alleged cases of corruption. Pakistan has formally conveyed to India that its nine-member judicial commission will visit here next month to interview key persons linked to the probe into the 2008 Mumbai terror attacks. New Delhi was informed on Tuesday that the Pakistan judicial commission will visit India in January 2012 and the mutually convenient dates of the tour will be finalised soon, official sources said. The commission will take the statements of Additional Chief Metropolitan Magistrate R V Sawant Waghule and Investigating Officer Ramesh Mahale, who have recorded the confessional statement of Ajmal Kasab, the lone surviving terrorist involved in the 26/11 attacks, to pursue the case in Pakistan. It also wanted to take the statements of the two doctors who carried out the post mortem of the terrorists killed.